Battle Tek Athletics announces the addition of the “Property of Battle Tek” Performance tees to its lineup of athletic clothing on its e-commerce site. A collection of the Property of Battle Tek Tee shirts were added to the site on April 9, 2010. We have provided a link to the Red Property of Battle Tek performance tee shirt for your convenience. More of these shirts can be found by shopping in the Men’s Tops Category. These highly popular performance tees are lightweight and extremely comfortable. Our customers tell us that wearing a Property of Battle Tek performance tee shirt is like not wearing a shirt at all! The reason for this comfort is because the Property of Battle Tek Tee Shirt is made of 100% micro mesh polyester. This in turn provides inherent moisture wicking to keep you dry and comfortable. Another great quality associated with the Property of Battle Tek Tee is it will not shrink. And wearing the Property of Battle Tek Tee Shirts defines your competitive nature by the statement boldly printed on the front of this performance tee shirt. 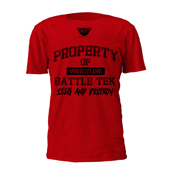 Each Property of Battle Tek Wrestling Tee Shirt has “Seek And Destroy” printed on it. What does this mean? It means that a competitive athlete goes after the opposition and defeats it! The Property of Battle Tek performance tee shirt is suitable for a number of venues. These shirts are ideal for casual wear, training, and making a statement about your talent as a wrestler! Battle Tek Athletics offers this lightweight performance tee shirt in 5 shirt color options: black, white, red, blue and grey. Suit up in Battle Tek Athletics Clothing and take on the competition! This entry was posted in home and tagged Battle Tek, micro mesh polyester, performance tee, performance tee shirts, tee shirts, wrestling.